Abstract Marine reserves are widely implemented worldwide to meet both conservation and fisheries man-agement goals. 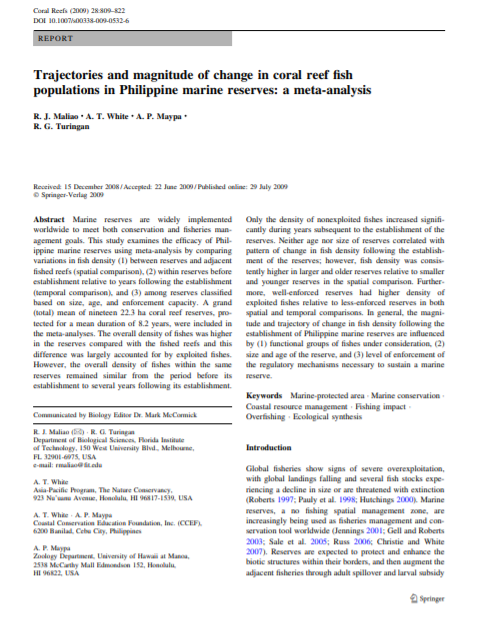 This study examines the efficacy of Phil-ippine marine reserves using meta-analysis by comparing variations in fish density (1) between reserves and adjacent fished reefs (spatial comparison), (2) within reserves before establishment relative to years following the establishment (temporal comparison), and (3) among reserves classified based on size, age, and enforcement capacity. A grand (total) mean of nineteen 22.3 ha coral reef reserves, pro-tected for a mean duration of 8.2 years, were included in the meta-analyses. The overall density of fishes was higher in the reserves compared with the fished reefs and this difference was largely accounted for by exploited fishes. However, the overall density of fishes within the same reserves remained similar from the period before its establishment to several years following its establishment. Only the density of nonexploited fishes increased signifi-cantly during years subsequent to the establishment of the reserves. Neither age nor size of reserves correlated with pattern of change in fish density following the establish-ment of the reserves; however, fish density was consis-tently higher in larger and older reserves relative to smaller and younger reserves in the spatial comparison. Further-more, well-enforced reserves had higher density of exploited fishes relative to less-enforced reserves in both spatial and temporal comparisons. In general, the magni-tude and trajectory of change in fish density following the establishment of Philippine marine reserves are influenced by (1) functional groups of fishes under consideration, (2) size and age of the reserve, and (3) level of enforcement of the regulatory mechanisms necessary to sustain a marine reserve.